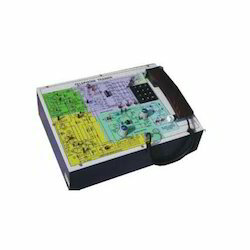 Providing you the best range of mobile phone trainer, telephone trainer, passive filters trainer kit, comparative study of ce, cb and cc amplifiers trainer kit, tape recorder trainer and function generator trainer kit with effective & timely delivery. Mobile Phone Trainer kit has capability of full duplex mobile communication. Provides basic theory and working fundamentals of a 2G hand set based on the NOKIA 3310/3315. This trainer kit designed with a view to provide network, power supply, charging ik user interface circuits for their praill.1 and theoretical study based on NOKIA 3310/3315. Telephone 'Rainer Is complete working model of telephone. It gives hands on experience on basic telephony concepts, working and different experiments on telephone. The trainer comes complete with exhaustive experiment manual, accessories, test points, and LED's for Indication. The complete circuit is printed on single sided PCB in section wise format, depicting the complete flow of system. Practical experience on this trainer carries great educative value for Science& Engineering Students. Study of Common Emitter (CE) transistor amplifier circuit and evaluation of its input & output resistance, voltage gain, current gain andpower gain. Study of Common Base (CB) transistor amplifier circuit and evaluation of its input and output resistance, voltage gain, current gain andpower gain. Study of Common Collector (CC) transistor amplifier circuit and evaluation of its input and output resistance, voltage gain, current gainand power gain. Owing to the changing and growing needs of customers, our company is offering a wide range of Tape Recorder Trainer. 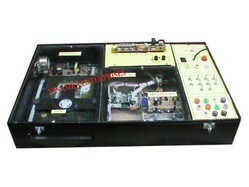 This Tape Recorder Trainer is highly acknowledged amongst for their inbuilt power supply. The Tape Recorder Trainer we offer is highly reliable and known for their best quality. The main IC's are provided on socket to provide a facility to check similar IC' and also to create the faults by inserting faulty IC's in the sockets. Two identical mono channels clubbed together to obtain stereo effect through stereo head both internal and external recording facility available. The “Function Generator Trainer ” is a versatile training kit for Electrical and Electronics Laboratories. It is designed to explain the fundamentals of Signal Generation. A Function Generator is a product that can produce various patterns of Voltage at a variety of Frequencies and Amplitudes. This Function Generator Trainer allows students to produce thedifferent waveforms and to understand the concept of their generation. With rich industry experience and knowledge, we are manufacturing, trading and supplying Analog Signal Sampling. The offered signal sampling is designed using high quality factor inputs and the innovative technology. 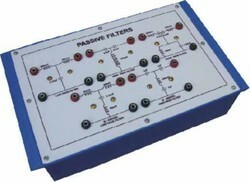 The offered signal sampling is widely demanded for its performance & quality. This range has sampling clock generator to provide sampling clock and gate pulse. Additionally, the offered signal sampling can be availed by our customers at competitive rates. Experimental Raining Board has been designed sec-clarets for the shell, of frequency shirt keying rroidulatIon and Demodulation. The board Is absolutely sell contained and requires only CRO.